According to studies, men in the U.S. need to take better care of their health. We look at how manufacturers can help by formulating with vitamins and minerals, fiber and lean protein to fight heart disease, diabetes, cancer and more. Some men actually take better care of their cars, sports equipment or computers than they do their health. According to the Centers for Disease Control, a lack of awareness, poor health education and unhealthy work and personal lifestyles have caused a steady deterioration of American men's health. Men's top health issues include cardiovascular disease, diabetes and prostate cancer. One in three men has some form of cardiovascular issue, according to the American Heart Assn. Strokes target more than 3 million men each year while hypertension is becoming more common in men under 45. A healthy diet, regular physical activity and getting quality sleep are critical to men's self care, and may help prevent heart disease and cancer, the top two killers for men over 35, adds the Academy of Nutrition and Dietetics (www.eatright.org). Healthful food ingredients such as antioxidants, probiotics, calcium, fiber, coenzyme Q-10, vitamin K2, D and other vitamins, protein and calcium are a few things food developers can use to boost health and keep men in the game. Younger guys are realizing they should take charge of their health, which creates opportunities for food companies to tap more clean-label and free-from ingredients, while offering more specific health-related/palliative products for older men. 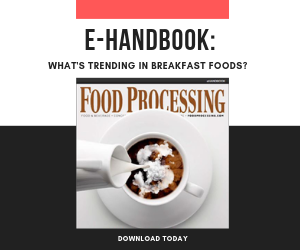 Food processors might find success developing breakfast foods targeting men. One in 10 consumers, or 31 million Americans, don't eat breakfast, according to market research from NPD Group (www.npd.com), and men 18-34 are the greatest breakfast skippers, at 28 percent. "With 31 million people skipping breakfast each day, there's a significant opportunity for food and beverage marketers to reach these consumers," says Dori Hickey, director, product management at NPD. "Marketing messages emphasizing the importance of a morning meal should be age- and gender-specific in order to increase their effectiveness," she says. "Motivation is the greatest barrier for men when it comes to health, but they'll seek products and services that help them achieve their ideal health," notes health and wellness analyst Marissa Gilbert of Mintel (www.mintel.com). Her research discovered fathers seek out more health information sources than other men. Gilbert points out when it comes to managing their health, men often rely on exercise, a positive mental attitude and vitamins, minerals or supplements. One of the best choices is vitamin D. Critical to regulating men's calcium metabolism, the sunshine vitamin fortifies many milks and milk drinks, including Bolthouse Plant Protein Milks from Bolthouse Farms (www.bolthouse.com) are rich in vitamin D2 and also contain 10g of pea protein per 8-oz. serving and 50 percent more calcium than dairy milk. Notable for its antioxidant and cancer-fighting properties, CoQ-10, is essential to living systems. New studies have found it can improve sperm movement in infertile men. Lipid-soluble CoQ-10 can be added to various packaged foods and beverages. It's heat-stable, flavorless and especially beneficial to the heart and for producing energy. Physicians suggests vitamin K2 for men because of its critical bone health benefits. Research points to K2 (menaquinone) as helpful for bones and heart tissue, preventing inflammation, aiding blood clotting and is more easily absorbed than vitamin K1. Chronic inflammation is the source of many diseases, such as obesity and heart disease. K2 is found in fermented foods like kimchee, pickled vegetables, sauerkraut, natto (a Japanese fermented soy mixture) and supplements. The Institute of Medicine recommends all men regardless of activity level consume at least 56g of protein each day, and more like 85-90g if they're moderately active. High-quality protein provides amino acids that muscles need to repair and rebuild, allowing them to recover from exercise and get stronger over time. The body also uses protein as a source of energy. Men like "caveman protein," especially steak, burgers and bacon. But doctors suggest leaner protein choices, without excess fat, and more plant protein to maintain muscle mass. It's especially important after exercise, as it's involved in just about every body function. Low-sodium jerky snacks are good options, especially for athletes. High in protein, jerky unlike other meats, doesn't have to be refrigerated, it's portable, convenient and tasty – and it's surprisingly lean. One "manly" version set for introduction in 2018 is PowerBar's (www.powerbar.com) first-of-its-kind protein bar featuring beef jerky, nuts and seeds. PowerBar Jerky & Nut Savory Snack Bars in original, barbecue and teriyaki flavors, will feature 10g of protein, 7g of fiber and 210 calories. The bars will cover two hot categories: snack bars; and jerky, which are both growing year over year, says Nick Stiritz, senior brand manager, premier nutrition at parent Post Holdings (www.postholdings.com). Jack Links beef, chicken turkey and pork jerky varieties typically have 11-13g of protein in a 1-oz. serving. An average jerky serving is high in protein and low in fat—both pluses. Thanks to the fact that jerky's typically low in fat, it's also often low in calories. Whey protein also helps fill the void. Protein-based beverages emphasizing fitness, health and energy include CytoSport's Muscle Milk whey-based protein smoothies (www.musclemilk.com). Parent company Hormel Foods has adapted the brand’s offerings to meet shifting demands. Lisa Selk, president and CEO of CytoSport, says the development of the brand’s recently debuted plant-based protein line, Evolve protein powder, in chocolate and vanilla, fits into its convenience-store positioning popular with men. The company also is diversifying the gluten-free Muscle Milk line to fit different use occasions beyond supporting athletic performance. Men also require more fiber to help them gradually absorb the nutrients without peaks and valleys in energy level. One of the first snacks to target men was Kraft Heinz's Planters (www.planters.com) Nut-rition Men’s Health Recommended nut mix in multipacks and cans. The mix of peanuts, almonds and pistachios contain a good source of fiber, protein, vitamins and minerals. Ashley Tople, head of brand building at Planters, says a lot has changed in men's lives. The brand surveyed consumers and found men are grocery shopping more (88 percent), taking care of household chores more (86 percent) and are more involved in child care (82 percent). They're also taking steps to stay healthy by exercising more (62 percent) and choosing healthier snacks (53 percent). "Men want a healthy snack they can feel confident about putting in their cart," added Scott Marcus, senior brand manager for Planters. Bunge North America (www.bungenorthamerica.com) offers what it calls Structured MCTs (medium-chain triglycerides) that deliver sources of rapid energy to the muscles instead of heading to the liver. Available in both oil and powdered formats, the C8 and C10 MCTs give muscles a source of energy in stressful situations in which the body needs to build extra protein, the company explains. This helps save amino acids for protein building, so they’re not used for burning energy. Clean-tasting, the MCTs can be used in snack and energy bars, gels, powdered beverage supplements, sports drinks, supplements and enteral nutrition beverages. Overdoing sugar can harm the livers of otherwise healthy men, a study from the University of Surrey in the U.K. shows. Scientists there found a sugar-rich diet (650 calories each day for three months) was associated with detrimentally high levels of fat in the blood and liver, and also increased risks of cardiovascular disease. By contrast, chocolate loving males can treat themselves to a chocolate bar here and there and not suffer any consequences, says a major study from Harvard Medical School. Harvard's research found a regular chocolate treat cuts men's risk of developing abnormal heart rhythms by more than one-fifth. The best results are gained by eating the same amount of chocolate two to six times a week, in which men's risk drops 23 percent. Chocolate has antioxidant, anti-inflammatory properties that help reduce the risk of developing heart problems. Flavanoids naturally occurring in cocoa can reduce the risk of atrial fibrillation, or an abnormal heart rhythm, by lowering blood pressure, cholesterol and inflammation. Prebiotic fibers, co-Q10, choline, K2 and other vitamins are needed to keep brutes healthy.